An outdoor surveillance and monitoring unit can inform you of the on-goings outside your property: Who rang the doorbell? What just made those strange noises outside? More importantly, they can give you time to alert law enforcement at the first sign of an imminent threat. There are countless security camera options, and choosing the right one for you can be mystifying. Store shelves and online descriptions can be a blur of information. Terms like infrared, CCD chips and CCTV can be hard to keep up. We have prepared this guide to help you go through outdoor camera systems. We hope the information you find in this post will help you decide what’s best for your home and family. Also called multi-camera surveillance and monitoring systems, an outdoor security camera monitors any activities and movements outside the area you choose. They are commonly placed at walkways, entrances, and driveways. However, each property is unique, so is every homeowner’s requirements; thus, where you put them will depend on a number of different factors. 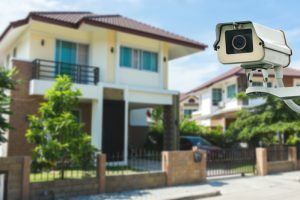 The result may be as minimal and basic as a front entry camera or more comprehensive, monitoring every “zone” or section of your front and backyard and outdoor site. These camera systems can either be wireless or wired and can be placed practically anywhere. 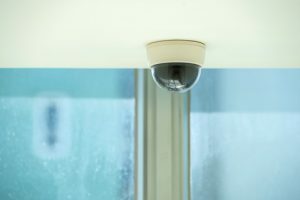 With a computer or monitor and a digital video recorder (DVR), you can view the camera feeds from a central location inside your property. The cameras can be merged with a home security system, if you have an existing one, with the option of getting a subscription to a monitoring service that can monitor camera feeds 24/7. This subscription can also alert you and emergency officials at the first sign of intrusion or any illegal activity the cameras detect. Furthermore, remote monitoring and surveillance is an excellent feature; you can view camera feeds on your mobile device such as smartphones and tablets anywhere as long as you have an internet connection. Security cameras also have the capability of recording and storing video files. Compared to indoor, outdoor camera systems are crafted with a broader viewing mode to monitor large outdoor spaces. They also have night vision capacity as well as weather resistance with a sturdy exterior. Analog security cameras rely on closed-circuit television (CCTV) surveillance. They are connected to a DVR or computer by transmission cables where the video feed is received. The DVR compresses the video file and keeps it onto a hard a drive. The DVR can convert the analog format into digital so that it can be streamed online through a web server. All the programming for the alarms, notifications, and other operations are made in the DVR. Also called IP surveillance systems, network security cameras are more expensive than analog because of their more advanced technology. There is no requirement for a separate DVR since the camera has DVR functions built into it already; aside from capturing and storing the video files, the camera converts and compresses them into an easily streamable format. Besides all the other advanced functions, high resolution is one of the main selling points of IP surveillance systems. With that being said, they do require more significant bandwidth and storage space. Here’s a rundown of some of the types and key features of outdoor camera systems. As always, keep your needs in mind when deciding what outdoor camera you want. Pay attention to the characteristics of each type of camera that suit your specific needs. Color security cameras provide a higher level of footage. On the other hand, a black and white image can capture light versus dark tones more clearly than precise color. However, when it comes to identifying a person of interest in the event of a burglary or home invasion, factors such as the color of the skin, hair can make all the difference. If you have a sizeable outdoor property, wide-angle lens cameras are the way to go. It can cover up to 104 degrees of activity and movement up to 40 feet. These cameras are usually located at entrances and mounted to a wall or ceiling. It’s only pointed in one direction and can’t move or zoom in and out. As the name implies, this is a dome-shaped camera. They are put in place to give a pronounced sense of “you are being watched” feeling. They are often set up in entryways so they are directly visible to anyone. This type is the complete opposite of dome cameras. It’s concealed and disguised as ordinary outdoor items such as a potted, plant, an electrical box, or even a garden gnome. This camera can capture videos and images in shadowy, shady areas and even in the darkest of nights due to infrared LED’s. Every outdoor surveillance system should have some level of protection against the weather and other natural elements. 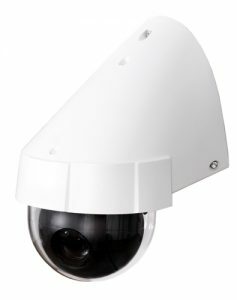 There are outdoor camera systems suited to every type of climate: rainy, snowy, heavy winds, high or low temperatures. Look for a durable hood that shields the lens so it’s not affected by precipitation. Apart from the weather, outdoor cameras should be protected from dust, UV rays, insects, and vandalism. This type of camera can adjust to changing levels of flare, backlight, reflections, and shadows that daylight and outdoor lighting present. Ideal for outdoor monitoring of large areas, this camera can capture different angles. It can be pre-programmed or controlled remotely.